Raised by Radloff Angus; sponsored by the Winneshiek, Clayton and Fayette County Cattlemen’s Associations - This purebred Angus steer gained the highest of the pen for the first half of the feeding period at 6.86 pounds per day and recorded on overall Average Daily Gain for the entire test of 5.5 pounds. At slaughter, he hung a 988 pound carcass and had the highest dress percent of the top 10% of the steers in the contest and a 15.1 inch ribeye. This steer secured his title as Champion by performing well across the board and marking a $7.52 Retail Value per Day on Feed, setting him apart from the second place by a whopping $0.72. This steer earned a $5,000 prize and the travelling trophy. Raised by Jeff Kock, sponsored by the Carroll County Cattlemen’s Association - Placing 6th is an April born steer sired by a Charolais bull and an Angus cross cow. This steer was not creep fed, but entered test at 871 pounds and gained an average of 4.42 pounds per day. A yield grade 1 and quality grade choice, he had a ribeye area of 16.54 inches and showed a Retail Value per Day on Feed of $6.50. 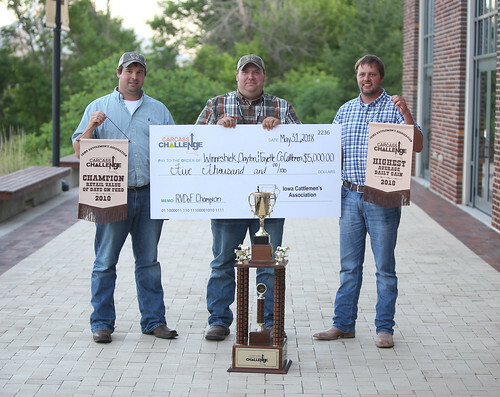 For a summary of performance and carcass data from the 2017-2018 Carcass Challenge visit our website at https://www.iacattlemen.org/carcasschallenge.aspx.